Gardening in Heavy Clay: A Great Solution… or Two! The weather has been unusually warm this spring, which gave me a chance get a head start in the garden. Over the past 3 weeks I’ve spent an hour or so every day cleaning old leaves out of corners, adding two more raised beds, uncovering the garden path stepping stones that our chickens buried in dirt over the winter, adding bags of garden soil to the new beds and tilling in sheep and peat. We cut down three overgrown lilacs, dug up the stumps and are planning to make that spot a sitting area in the garden — a nice place to have coffee in the morning surrounded by lush gardens, birds and bees. I’ve been gardening in Colorado since 1985 and it has been a struggle. All of the places we’ve lived had heavy clay soil. Our growing season is short: last frost date is in late May and some of our trees’ leaves begin turning color as early as July. The sun in the summer can be blistering, we don’t get much rain and when we do it usually also brings hail. But I’m a gardener through and through and just can’t make myself stop trying. Raised bed in early summer. After struggling with our clay soil for about 10 years, diligently adding amendments and going as far as buying a rototiller to save my back, I finally saw an article in a magazine about raised beds. I’d seen them before but never gave them much thought since they looked expensive. But two years ago I decided to try just one. We built a raised bed on one side of the garden. It’s about 10′ x 10′ and about a foot tall. On the other side of the garden we tried gardening in bags of garden soil placed on the ground — sort of mini raised beds that you don’t have to build. 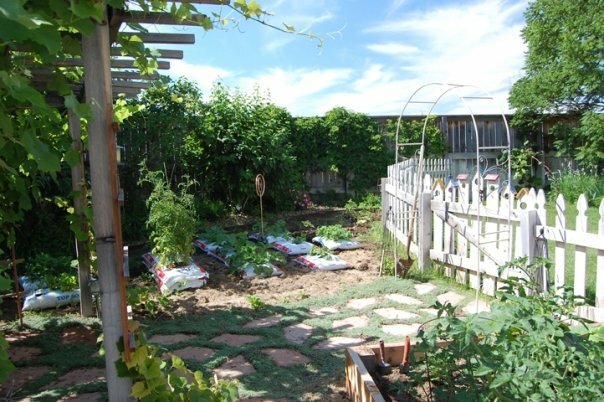 The raised bed was built with double stacked 6’x10′ treated wood planks. 4″x4″ posts were nailed in the corners with legs sticking out below. These legs were buried in the ground at different depths in order to make the bed level. We filled the bed with bags and bags of garden soil and mixed in some sheep and peat. 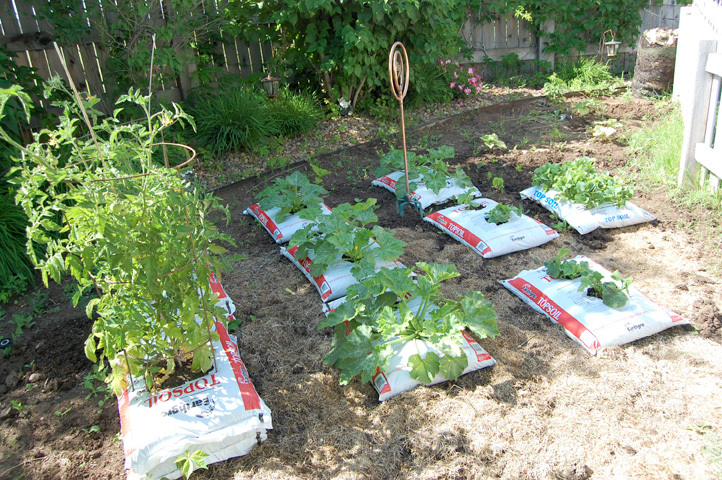 The soil bag garden was much less formal and permanent. I stabbed a weed puller a few times on the back of each bag and flipped it over so the holes were facing down. Holes were cut on the top side to insert plants. For deeper root plants such as tomatoes, I stacked two bags, cutting larger holes between them for drainage. Both systems solved two problems I was having with gardening in our dense clay: the plants could grow in perfect soil, and drainage was perfect as well. You see, even though I amended and amended our in-ground garden both spring and fall for years, the clay seemed to devour the amendments yet never improved. Plus, I was basically trying to grow a garden in a large clay bowl with no drainage. Water would go through the amended soil and sit at the bottom, pooling in the clay that lay below. With the new raised bed, the water could drain through the nice soil and out of the bottom of the bed. 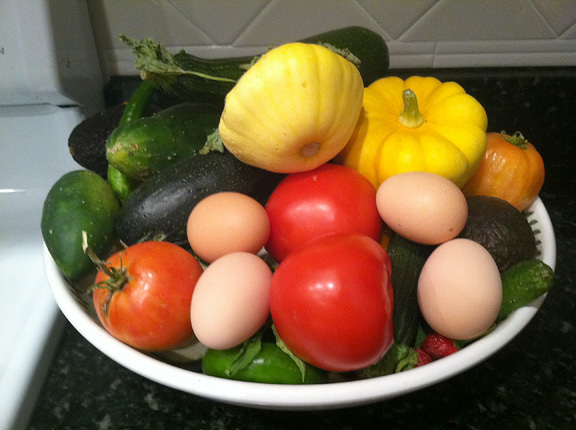 Garden harvest: Eggs not included. The following summer we added another large raised bed and two smaller ones and used the previous summer’s soil bags for filling. This year (2012) I added two more small ones and the garden is now complete. 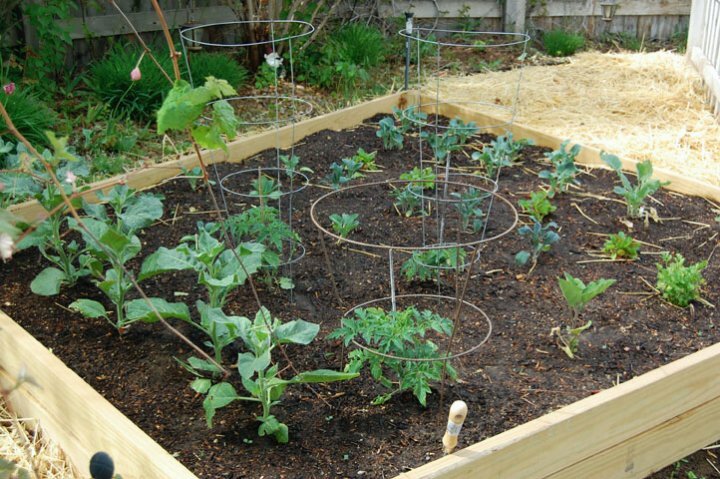 Rather than building them from wood again, I found raised bed kits at Walmart that are made from recycled plastic. I stacked two kits together for each bed. They look nice and blend well with wood beds. They probably cost about the same, were much easier to build (no hauling heavy planks home from the store; no cutting). They would also be much easier to relocate, if necessary. We’ll see how they perform this summer. I’ve adjusted sprinkler heads to cover the beds, and when the plants get too large to water from above (the big leaves redirect the water in all directions), I have soaker hoses snaking through the beds to take over the job. I’ll update this post with my progress this summer. I’ve been starting a lot of my plants from seed, sometimes starting tomatoes and peppers in January in order to have vegetables before the first frost. It’s a lot of work sometimes and not always successful. This Christmas I bought myself an LED grow light to see if I can keep vegetables or herbs growing indoors all year round. I’ve experimented with it, and I have to say it blew my mind. 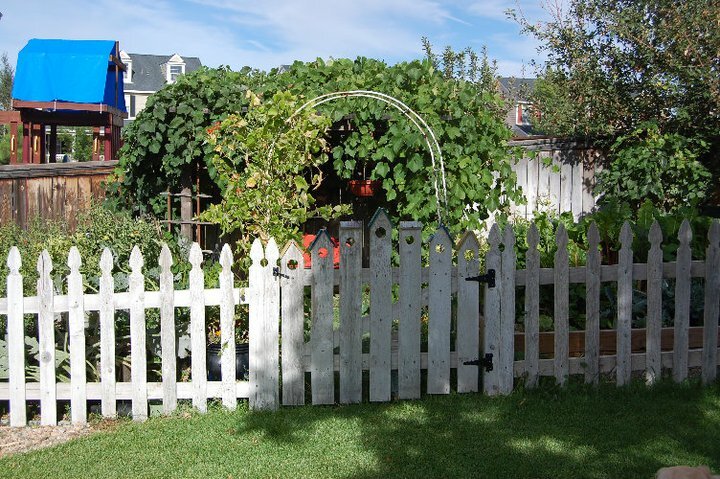 In January I planted a variety of vegetables and herbs and the growth was amazing. We were eating greens 4-5 weeks after planting seeds. Green beans a week later. Growth was strong, healthy and incredibly fast! I was able to start some plants from seed that I’d previously had no success at all. So, I started my next batch of seeds a week ago, this time intended for transplanting to the garden in late May. 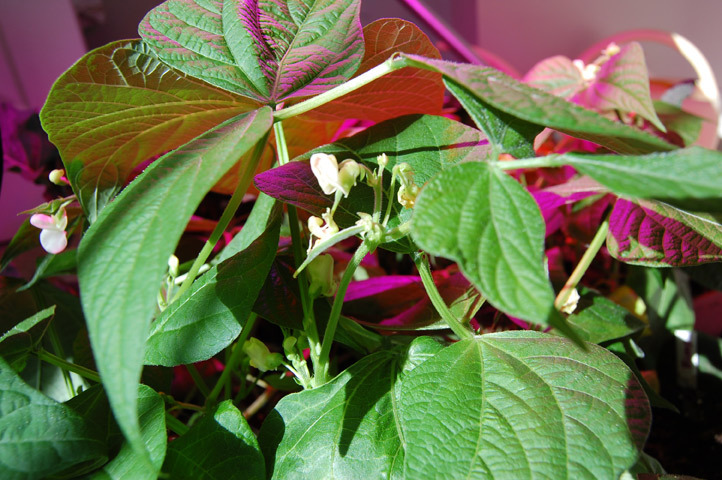 I’ll do a separate post on what I’ve learned about increasing indoor seed starting success and my super duper booster LED grow light. This entry was posted in gardening in clay, gardening in colorado, gardening solutions, great garden soil, raised beds on April 16, 2012 by Farmer Deb. 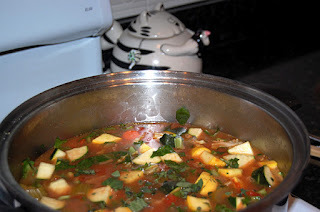 Spoiler: A link to my Kitchen Sink Soup recipe can be found below. I really love a hearty soup. Living in Colorado, our winters can begin in early October and last pretty much into May. I’ve come up with a lot of soup recipes over the years. I think of soups as perfect food: you can have you veggies, protein and carbs all mixed together in one warm, thick, hearty, delicious and satisfying meal. Soups can be very forgiving: you don’t have to follow soup recipes like a scientific equation. If you like the ingredient, it will play nice in the pot. As a mother, I’ve also found that you can pack extra nutrition into soups and fussy eaters won’t even know it’s there. Nutrition espionage at its finest. Stone soup? I think not! I remember being in Kindergarten and Mrs. Rogers, our teacher, told us a story about stone soup. Her version was (and I’m not quoting her accurately here) there was a homeless man camping in the woods. He had no food and no one in the village was charitable enough to give him any. Some children came upon him in the woods. He had a campfire going and a pot of water boiling over the flames. Nowadays this story would never be told — who in their right mind would want their kids visiting with a hobo in the woods? Anyway, the kids asked him what he was making. He said “stone soup” — and he tossed a stone into the boiling water. He said the soup was normally extremely delicious, but this one was missing something. A few carrots maybe. One of the kids ran home and brought him carrots. He tasted the water and said, “I bet an onion would make this taste great.” So another kid brought him an onion. He tasted the soup and said, “something’s missing, I think some celery would make this taste even better…” and so on until the kids had brought him many ingredients and he finally had this masterful soup. Well, I just thought he was the cleverest hobo that ever lived! And the story has stuck in my mind to this day. My Kitchen Sink Soup always reminds me of this story. I wasn’t planning to make soup this week. It has been sunny, glorious and at least 70° every day. Not exactly soup weather. But I had a few odd bits of vegetables left in the fridge from my excursion to Heavenly Harvest Produce a couple of weeks ago. I also had some leftover cooked veggies. None of them added up to a full serving. Tie breaker: I bought some pork neck bones for my dog as an experiment. She is on a raw, species-appropriate diet, and I’m always looking for something new and economical for her to eat. I hadn’t added too many different bones to her diet, preferring to stick with the ever-safe natural chicken backs from WholeFoods and an occasional pork rib. The neck bones looked meaty and the bones didn’t look too thick and hard. After opening the package I found only one I was willing to give to my dog, so I thought the rest would make a nice broth. That’s when I decided that soup was definitely going on the menu. Yes, they are in my sink. Like my Kitchen Sink Salad, the name comes from my tossing an odd assortment of vegetables in the sink for rinsing. I also consider the soup consisting of “everything but the kitchen sink.” Gotta keep an open mind. I start out with my typical basic soup base: a chopped onion, 2-3 ribs of chopped celery, a few cloves of chopped garlic and 2-3 chopped carrots. Sometimes I saute them in super-healthy coconut oil, but this time I opted for extra virgin olive oil. I saute these in a dutch oven until the onion starts to approach translucency. At this point I added the pork neck bones, browned them just a little bit, and then added 8 cups of chicken broth. Since the pork was raw going in and I wasn’t going anywhere, I turned the heat way down and let it simmer for an hour plus. I added some salt and pepper at some point. When it looked “right,” I turned off the heat, moved the pork bones to a plate and left the pot on the stovetop to cool down. Once the bones cooled off, I stripped the meat off, put it in a separate bowl and placed it, covered, in the fridge. My son is a vegetarian and so to make life easier, I make one big pot of soup (he doesn’t mind broths, he just won’t eat meat) and keep the actual meat bits separate for my own dining pleasure. When I had gathered all the other ingredients I wanted to put in my soup, I turned the burner back on, starting chopping veggies and adding them to the broth as I went along. Once the pot was full, I let them simmer for about 30 minutes. I had some teensy alphabet pasta in the pantry and threw it into the broth to soften. When we were ready to have dinner, I put some of the meat bits into my bowl and we served ourselves the hot soup. We grated some parmesan cheese on top and toasted and buttered some artesan bread for dunking. My absolute favorite is the rosemary bread sold at WholeFoods — not only is it delicious, but when you toast it the fragrance of rosemary fills the kitchen. It also makes heavenly croutons. My African Greys and our pet rat also got–and loved– some soup for dinner. What was left was given to the chickens who quickly cleaned their plate. There’s nothing so universal as good, healthy food. The recipe is here for those who like to keep recipes. PS: I finally broke down and bought a juicer this week. After watching this VIDEO of a doctor who cured her own MS by eating a lot of raw vegetables, plus a few years of internet research, I feel that nothing is better for our health than raw natural food. Supplements are okay in a pinch, but our bodies really run the best on the real stuff. What could be more natural? 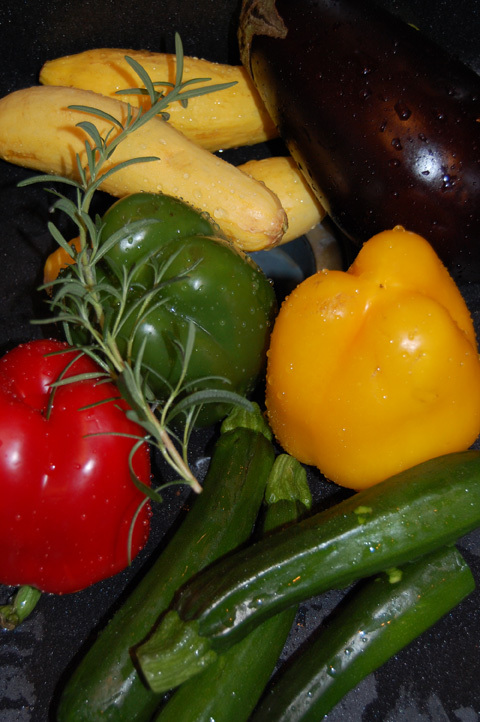 So… there may be a third Eat Your Veggies post in my future, but probably titled “Drink Your Veggies.” Stay tuned! 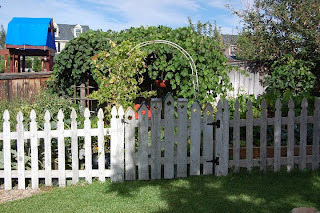 This entry was posted in growing vegetables, homemade vegetable soup, organic food, soup recipes on April 3, 2012 by Farmer Deb.